Two children embark on an extraordinary and mystical journey, to discover their own pathways to peace. For children of all ages, this picture book invites creativity, imagination, and exploration of the beauty of world and the universe. 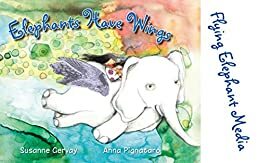 Written by multi award winning children's author Susanne Gervay OAM and illustrated by multi award winning artist Anna Pignataro, 'Elephants Have Wings' is a picture book to be treasured and revisited, again and again. 'This beautiful picture book is based on the parable of the blind men and the elephant. The ethereal illustrations are a rich tapestry, bringing depth to the words and challenging the reader to discover their own truth.' Reading Time, Children's Book Council of Australia. 'The book demonstrates with great power that we can teach our children, profound truths and timeless value.' Professor D.R. Pattanaik, Banaras Hindu University, Varanasi, India. 'There's a gentleness to this book about accepting difference.' Sydney Morning Herald.